DC’s The New 52 has some hit and miss moments, but the Batman Collector’s Sets they are releasing are all hit! A while back we shared the Batman: The Court of Owls Book and Mask Set and now DC is releasing the Batman: Death of the Family Book and Joker Mask Set. Batman: Death of the Family Book and Joker Mask Set includes the stories from Batman’s New 52 run that changes everything in Gotham. 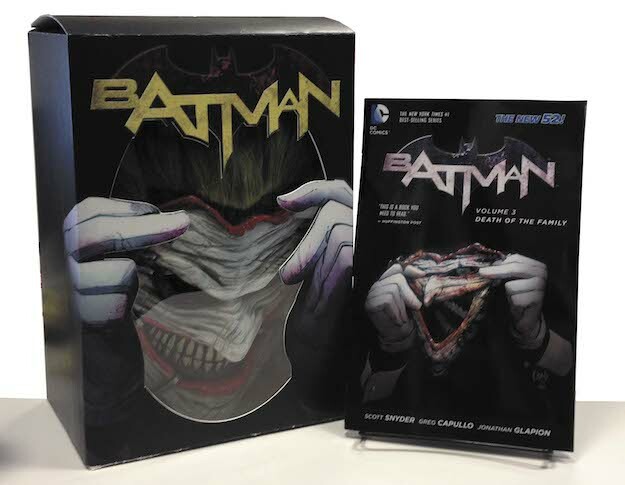 The seminal trade paperback graphic novel, BATMAN: DEATH OF THE FAMILY, is now paired with a rubber replica mask of facial flesh worn by the Joker, a must-have for any true fan of Scott Snyder’s groundbreaking work. This is the third in DC’s series of book and mask sets, following the very popular V FOR VENDETTA BOOK AND MASK SET and the BATMAN: THE COURT OF OWLS BOOK AND MASK SET. The set is less than $30 on Amazon and looks incredible.